NEW: For Sale Inventory Added! Regular visitors can check back to this "News" page to see highlights of my most recent site updates. If I add something special, you can be sure I'll make note of it here (see dated blog entries below the images). 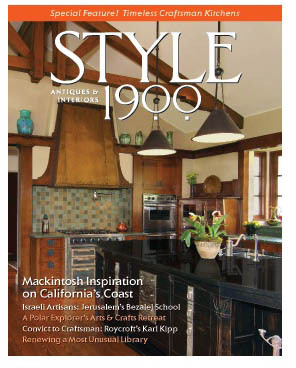 Sticky: full pdf of Convict to Craftsman: Roycroft's Karl Kipp my article that appeared in Style 1900 Magazine. Subscribe to Style 1900! 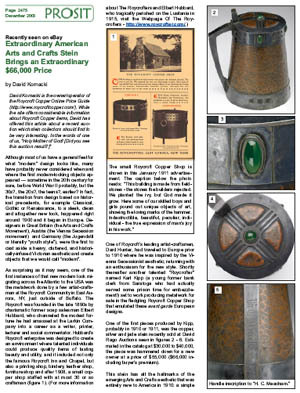 Sticky: my article for Stein Collectors International from Prosit - The Beer Stein Magazine. 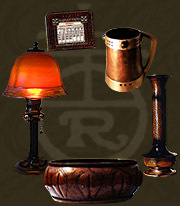 2/27/2011: A handful of Roycroft copper fans have already discovered my new RoycroftCopper Facebook page. This is my Roycroft blog, so check it out for more news, pics, cool finds, random thoughts on Roycroft and other Arts and Crafts metalwork and more. 11/15/2010: Here's a once in a lifetime photo that I took at Dave Rago's October 2010 sale. Three rare (hah!) 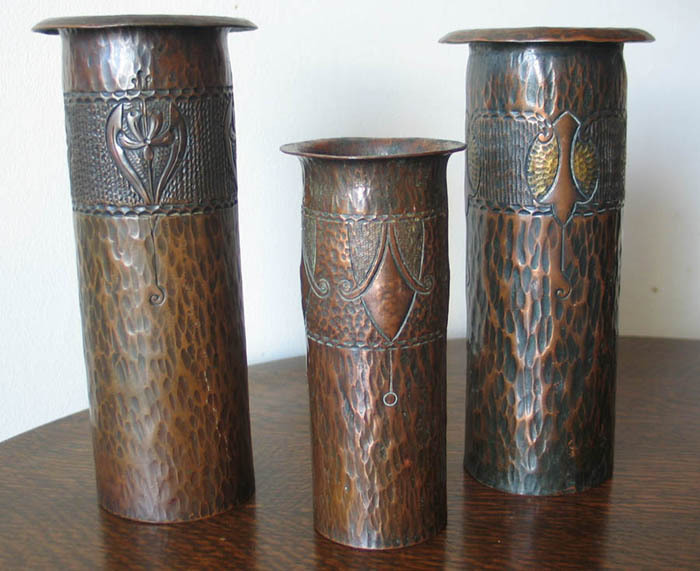 Karl Kipp trefoil design cylinder vases reunited 95 years after they were made! Mine (left), Doug McFarland's (center) and the one in the sale (right, sold for $8,400). 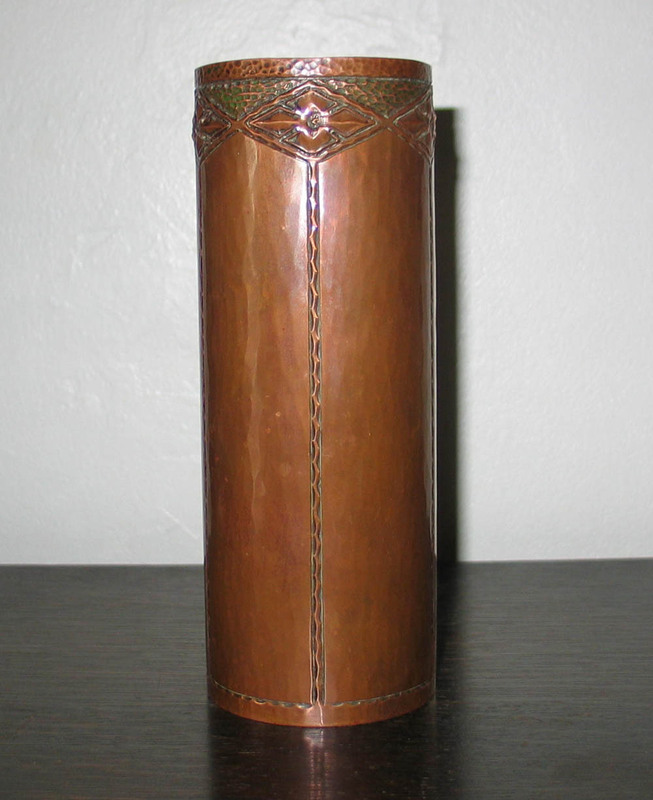 03/14/2010: Since there is certainly more to Arts and Crafts metalwork than Roycroft and Karl Kipp, here's a big pic of a nice Craftsman Studios cylinder vase I recently acquired. Note that pieces like this bearing a CS in a circle mark were NOT made by Carl Sorenson. They are early (perhaps pre 1920) Craftsman Studios work. For a full explanation, visit this thread in the metalware board in the Arts and Crafts Society Forum. 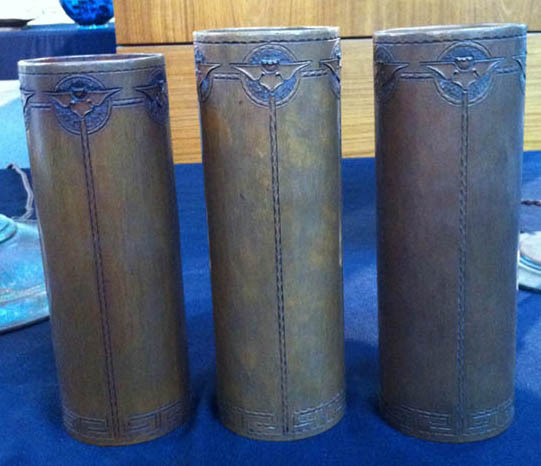 03/10: Added a rare cylinder vase most likely made by a Roycrofter to the Vases I page. 10/5/08: Added a rare 9 inch Italian Polychrome cylinder vase. I've been waiting years for one of these to show up and this one is absolutely beautiful. Kudos to the lucky collector who bagged this one! 10/4/08: Added another rare, absolutely gorgeous, Secessionist-style jardiniere. 10/3/08: Added the rare and spectacular Roycroft/Karl Kipp stein that sold at Rago's. 9/23/08: Added a rare 7 inch Karl Kipp tray that just sold on ebay. 9/1/08: Added the excellent and probably unique poppy motif serving tray that sold on ebay earlier this year. Ever wonder what to do with a big Roycroft lampbase missing its original Steuben dome shade? 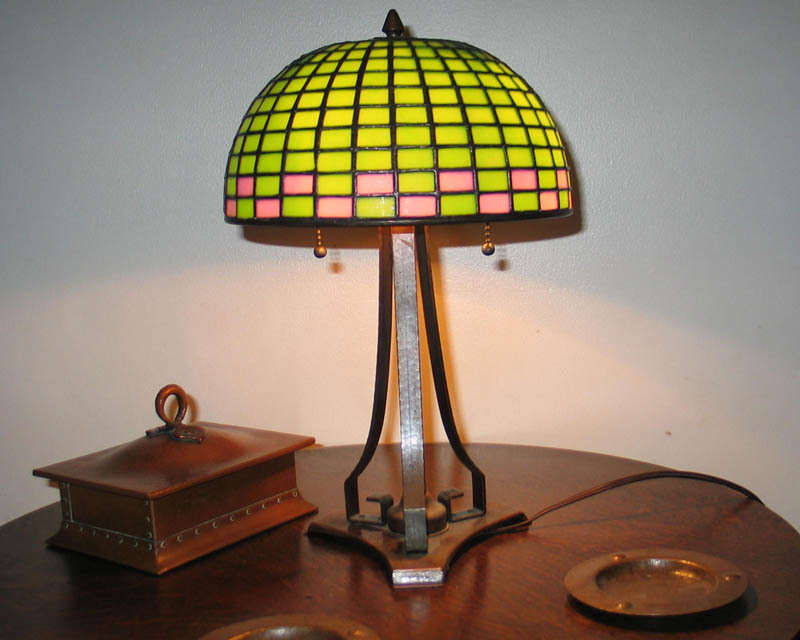 Here's one solution: the lamp Roycroft SHOULD have made! 8/31/08: Was taking some pictures so I snapped one of my miscellaneous vases cabinet as it exists today - maybe somebody will find the pic interesting. 12/9/07: Two rare pairs of Jennings bookends added to the bookends page. 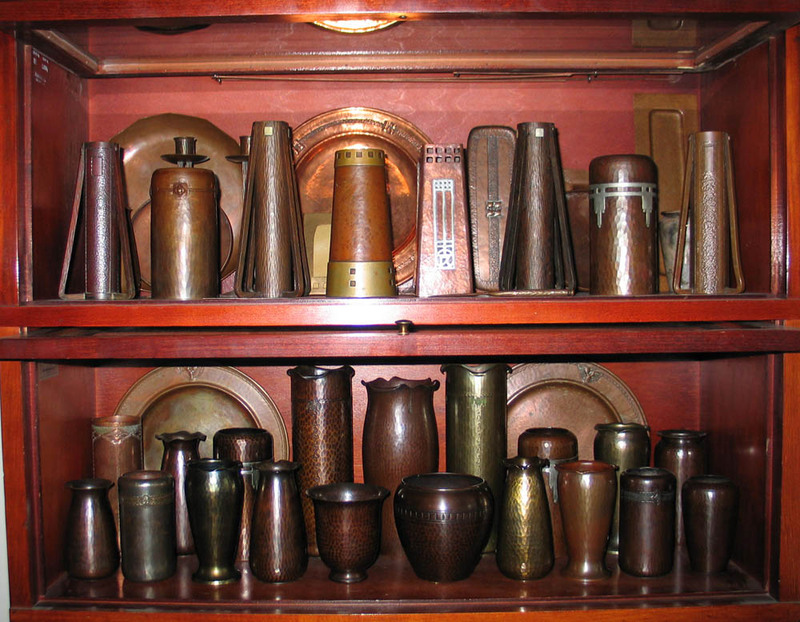 8/25/07: I havent updated the site in a while since I have been working on my Roycroft Copper book project, an article for Style 1900 Magazine, and a lecture I'll be doing on Roycroft copper with fellow collector Doug McFarland at the 2007 Steuben Collectors Symposium in Corning NY. But I just spent a few minutes posting some recent ebay results here and there -- like a nice Kipp buttress vase that sold for over $3000 in July. 1/25/07: Added a rare tooled octagonal tray to the Trays page. 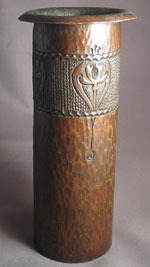 Also added a big pic of an early 7 inch cylinder vase that has the two-dot mark. 12/9/06: Haven't touched the site in a while as I've been working on my Roycroft Copper book project (it's gonna be awesome!) as well as spending time adding picture content to Fulper.net. But I recently acquired an unusual little Karl Kipp vase that I thought others would find interesting, so it's up on the Vases II page. I'm not a big fan of silver plated Roycroft/Kipp, but this little guy has a rare shape and size so it's worth checking out. Special thanks to Carol for bringing it to RoycroftCopper.com! 07/24/06: Added a wonderful, possibly unique, tiny cylinder vase (or chasing tool cup) with diamond flowers made by either Jennings or Kipp. 05/10/06: Added a buttress vase that just sold on ebay, along with finally posting some of the better items sold at David Rago's auction back in March -- these include two trapezoid vases, the large rare 3-footed candlesticks, and a 22 inch American Beauty Vase. 04/22/06: Added a rare large 3-footed jardiniere recently sold at Pacific Galleries Auction. 02/26/06: My somewhat lame GPI 2006 Photo Gallery!!! 2/11/06: Added a pic of the circa 1912 Old Willow Stump bookends. 12/27/05: Added a wonderful newly discovered 7 by 2 inch Walter Jennings cylinder vase (Vases I). 12/21/05: Added a variety of things that sold on ebay over the past few months and updated auction results. 05/18/05: Added a rare EA Fuchs large candelabrum. Added a few choice items from Rago's 5/05 sale (yellow/blue leaded lamp, panel buttress vase, "Hunter" lantern, uplighter). 04/22/05: Added a couple examples of very rare large cigar boxes that showed up on ebay recently. Also updated with some recent auction results. 03/11/05: Updated with recent auction price results, added a giant pic comparing two silver square buttress vases, and added my recent Glascow rose vase acquisition. 02/21/05: GPI 2005 Photo Gallery!!! 12/27/04: Added a pair of rare triple stem candleholders. 12/21/04: Added a rare Italian Polychrome low bowl. 12/5/04: Added 2 rare and spectacular Kipp circular lidded jewel boxs, one with silver squares (Treadway Gallery Auctions) and another with a square handle and circular hammering. 12/3/04: Added rare triple candelabrum with jade stone, courtesy David and Debbie Rudd, Daltons. 10/21/04: Just for fun, I created a Fulper VaseKraft Lamp gallery at Fulper.net. some nice things from David Rago's 9/04 auction, including a large jardiniere, a Roycroft/KK cylinder vase, WJ tray, and a pristine record-setting large leaded lamp. better pics of some of my recent acquisitions -- tall tulip sticks and a great poppy letter holder.a rare early hat pin ("Other" section) with decorative squares (neat!). updated with numerous recent auction results. 7/11/04: added a rare small early bowl, artist signed, that recently fetched the mighty price of $1900 -- a Roycroft price per pound record? Also updated with some recent auction results on various pieces. 2/2/04: added a rare Walter Jennings simple scallop edge tray double signed WJ and in script. 1/28/04: a very generous (and fortunate!) collector recently provided pictures of a mind-blowingly exceptional Walter Jennings cylinder vase that came from the Jennings family, as well as a rare model C-904 large mica lamp. Check out these wonderful recent additions! 1/15/04: I posted a link on Vases I to a large pic of four german silver bullet vases that reveals some of the variations that appear in this form. 1/09/04: a rare Roycroft 3-legged buttress vase with great color added to Vases I; an early nut bowl added to Bowls. 12/27/03: I spent some time updating the "Marks" page with some info on early mark variations and dating with marks in general. Ignore what the other guys say, I think my dates are pretty reliable. 12/13/03: I'm very pleased to have added pictures of a recently "discovered" rare Walter Jennings signed and dated 1917 cylinder vase to the Vases I page, along with some new text and pictures on cylinder vases in general and how to evaluate and price them. Peek inside my display cabinet!